WordPress is the most popular content management system which powers millions of websites and blogs. There are many popular websites running on this CMS. Techcrunch and Mashable are the examples of popular WordPress based websites. So, if you are planning for a new blog or website, you can go for WordPress. WordPress is best in many ways. But there is a problem with most of the people face with WordPress. After some posts, the blog speed goes down and it takes more time to load. And we know that website speed directly affects your website’s ranking in Google search results. If you are also facing this problem, you are at right place. There are many optimization WordPress plugins are available which you can be used Speed up WordPress blogs and improve the performance of your blog. Along with these optimization plugins, there are also few other things which you should follow to Speed up WordPress blogs. You should try these Things to speed up WordPress based blogs and website. It is recommended to use a good quality theme. Here, Google quality means theme which is coded to be lightweight and use less resources. Every theme is coded differently and it depends on theme to be fast or not. Default WordPress themes are fast but if you switch to other themes, you will see noticeable amount of change in load time. There are various attractive themes available which look good but make your website slow. So, It is recommended to go with a theme with less loading time. I recommend you to use themes from Elegant theme, Mythemeshop, Magazine3 and Theme Junkie like companies. You can also use Thesis and Genesis frameworks. Take extra care purchasing themes on popular marketplaces such as ThemeForest. Read review and also check load time of websites before making final decision. Caching is the most important thing which you should always have in your WordPress blog. You should install one of the popular WordPress Caching plugins. You can try W3Total cache or WP Super cache. I personally use WP Super Cache and recommend this. Caching plugins help you in reducing server load by caching pages as static HTML content. When a visitor request for those pages, static HTML content is served and thus it saves multiple db requests. It makes web page service faster and improves your website’s performance. Most of the people use caching plugins as a primary way to Speed up WordPress blogs. It is another thing which you must take care in your blog. Images takes enough time to load. So, you should either upload images of less size of have something which can compress your images. I recommend use of WPsmush.it WordPress for this. This plugin compress images thus it takes less time to load those images. It optimizes JPEG images and stripping Meta data (like captured data, camera model number, etc.) from JPEG images. Read how to install and use WP Smush it. When you keep on adding new posts, database becomes larger. WordPress also saves all the revisions of a posts. So, you need to do regular database optimization. You can do this via available plugins .WP Database Optimizer is a nice plugin to optimize your WordPress database. It reduces the time of queries from the database by removing the Post revisions. It also remove auto-drafts and optimize database tables. You can also use this plugin to take backups of your blog. CDN (Content Delivery Network) is the best thing if you have a big website. CND helps you in distributing your static content across the world and hence reducing load time. It caches your static content including images, css, js and videos to all its servers spread across the globe. When a visitor requests for a page, resources are served from the nearest CDN and thus it reduces network delay. Most popular and reliable CDN service is MaxCDN. It has many plans and you can select according to your need. If you have big business online, I recommend using CDN to improve your website’s load time. In case you do not want to pay, CloudFlare is a free CDN service. Most of the web hosts support CloudFlare so you can also take advantage of the service. It also has a plugin for WordPress blog. Another advantage of using CloudFlare is that it protects your blog from various kind of web attacks. So, using Cloudflare makes your blog secure and fast. It is recommended to use less plugin. It is because every plugin includes its own CSS and jS file and increases the number of page elements. I have already talked about combining CSS and JS files. Try to reduce number of plugins and do most of the work without plugins. You can add functionality direct in WordPress theme and avoid plugin for small tasks. Lazy loading is an important thing which you can implement in your WordPress blog to make it faster. Lazy load is the concept of loading the element only if it is in view port. In this way, you can avoid loading or all elements at once and improve load time. To implement lazy load of images, you can use free plugin called BJ Lazy Load. It automatically implement lazy loading of images in your blog. If you use WP Rocket caching plugin, it also has an option to lazy load images. If you want to add lazy load for videos, you can install Lazy Load for Videos plugin. It replaces embedded Youtube and Vimeo videos with a clickable preview image. On clicking the image, it will load the video. In this way, it can reduce considerable amount of load and improves website load time. Disqus Conditional Load is also a nice plugin which can help you in reducing the load caused by Disqus. You can use this plugin to add conditional loading of disqus and improve the load time. When we install a plugin, it adds its own CSS and JS files. Installing many plugins increases the number of included CSS and JS files. The more number of plugins, more http requests. So, you should try to combine CSS files in one and similarly js files in one. Try to do this if you are confident that you can do this without affecting the code. For this, you need to edit plugins code and remove the css or js include code. And then copy the css code to the master css of your blog. And copy the js code in the master js file of your blog. Try to have only one CSS and one js file. If it is not possible, try to have as less as you can. Compressing your web pages also makes it faster. So you should try to install GZip in your website to save bandwidth and speedup load time. Whe a visitor visits your website, he will be served compression page and browser will automatically decompress file to show the content. There are few plugings which automatically adds Gzip in your blog. You can also do this manually by adding few lines in the .htaccess file. Once you have added these lines in your website’s .htaccess file, check if it is working or not. Open check Gzip compression and enter the website URL. When a browser displays a web page, it load several things including logo, css, js to display the page to visitor. If you have browser enable, it will save these static things in browser cache. If user visits other page of your website, browser will server these static content from the local cache and thus it reduce the http requests and improve the load time. Most common way to enable browser caching is to add some code to .htaccess file. Just add following lines in that file. After adding these lines, save file and refresh the page. This is not only to Speed up WordPress, you can also use this if you have any other CMS or custom coded website. This is another small but helpful move. Try to have css files at the top of the page because browser will not render the page before css files. ANd JS files should be at bottom because these are not necessary for rendering the page. So, moving js files to bottom will gave additional improvement. 12. Minify css and JS. This is also an important thing which you should take care. Minifying js and css files reduce the size of these files. Better WordPress Minify is great plugin which can help you in having control on the css and js files of the blog. You can move the placement and minify. Few plugins really cause issues and you should uninstall those plugins. To know what plugin is causing issue, you can try P3 Plugin. I personally use this to identify which plugin is creating problem in my blog. This plugin helps you to easily spot which plugin is slowing down your blog. Try to uninstall the plugin which is taking time in load. You can also find alternate plugin with similar functionality from the WordPress plugins directory. Try to have as less plugin as you can. The more number of plugins you will install, it will impact the load time. 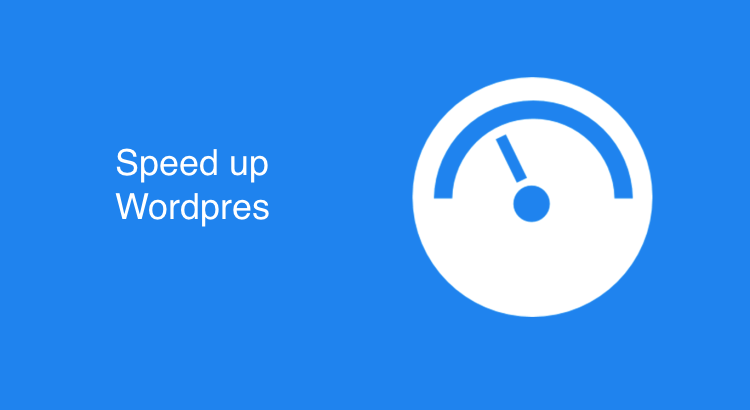 If you really want to Speed up WordPress, you should take extra care in plugins. Yes, you should always try to go with good web hosting companies. There are various cheap host available which claims to offer so many things. But you will end up having a slow website with other problems. I always recommend using BlueHost and Hostgator for hosting. These are good and affordable. After following the give steps, you will surely see the improvement in the speed of your WordPress blog. In case you have problem or you are not tech savvy enough to do these tasks, you can contact me for help.